In April 2012, Klaudia Oliver, Steve Brown and I were all invited to attend the TEDxSummit in Doha, Qatar — a weeklong event exclusively for TEDx organizers. Hosted by the Doha Film Institute, the inaugural event gathered TEDx organizers from around the world for workshops, talks and cultural activities. 750 people from all walks of life converged in the Middle East to share their stories, experiences and ideas from their own TEDx programs — but when we introduced ourselves and said, “Black Rock City” ears perked up. Certainly there are a lot of people curious about Burning Man. I’m always amazed at the multitude people around the world who had heard of it, been to it, want to go to it — and even more interesting, how many have been to Regional Burn events. Even the ticket situation this year was a topic in the Middle East. 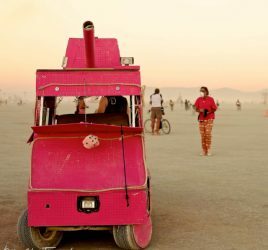 We were on an excursion, far out into the desert by caravan when I had someone ask me, “Hey, do you know how I can get a ticket to Burning Man?” It was surreal. But describing how incredible it was to put on a TEDx talk in Black Rock City seemed to be the prevailing conversation. Let’s face it — we are the only temporary city that I know of to host such an event. From a production point of view, everything is radically different. Things like shelter, power, staging, lighting, green rooms, audio/visual — all of these must not only be brought in for a week but also have to withstand the harsh environment we have come to love at Black Rock City. 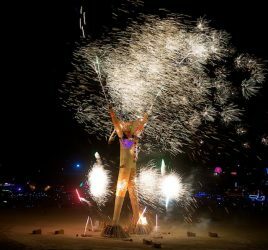 A large volunteer team is needed to make this happen and giving one day of your time, even a few hours is challenging when you only have 7 days to experience Black Rock City. Finding the best speakers and performers is also complex in a community that is evolving and changing. Communications is a challenge as there are no Internet or telephone capabilities. So a large part of the production requires some thinking outside the box — quintessentially TEDx by nature. One of the best things to come from our experience in Doha was the ability to connect with other organizers who are also Burners. This year, the TEDxBlackRockCity team consists of over 12 Burners — all TEDx organizers — from around the world! We have organizers from Toronto, San Miguel de Allende, Amsterdam, Valle de Bravo, Phenom Pehn, London, Maui, Ashville, South Lake Tahoe, Ojai, Stanford, New York, Detroit and the list keeps growing. I think it’s incredible that this team of thinkers and do’ers are not only connected through their commitment to their own communities, but to Black Rock City as well. If you are interested in helping out by volunteering for our event, we would be grateful for the gift of your time and experience. You can sign up here!